Charlie Hoey and Peter Smith took 9 months to develop The Great Gatsby as a game. The literary mashup became a phenomenon and has been “liked” 177,000 times on Facebook. 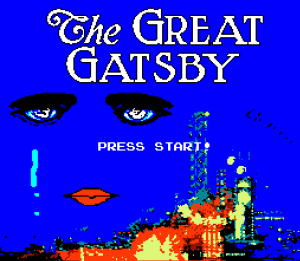 Earlier this year a bizarre video game appeared online: a version of The Great Gatsby for NES. In this old fashioned multi-level game, Jay Gatsby had to fight off marauding butlers, flappers, crustaceans and other enemies by throwing his bowler hat at them. The appearance of a game based on classic literature wasn’t such a stretch. After all, Nintendo released game cartridges featuring e-book versions of American, British and French classics and even set up shops inside bookstores in Germany. “Game in a Book – The Great Gatsby: Case Study” will be presented, 2:00 p.m., October 12, as part of the StoryDrive Conference at the Frankfurt Book Fair. Almost instantly, The Great Gatsby for NES went viral; and very soon afterwards this mysterious origin story was exposed as a myth. In fact the game had been created by Charlie Hoey, a San Francisco-based web developer, and Peter Smith, an editor for the online pop culture website nerve.com. A Gatsby adaptation appealed to Hoey and Smith not only because both men were big fans of Fitzgerald’s magnum opus, but also because they calculated it was one of the very few books in America that everybody was familiar with, having studied it in high school. Even so, they anticipated that the audience for their book-game hybrid would be small, to say the least. “At the time I thought that if you were to draw a Venn diagram for people who love The Great Gatsby and who also love Nintendo cartridge games, then there would probably be two circles in it — me and Peter,” says Hoey. Thus they worked on the project at a leisurely pace, and felt free to embrace highly playful ideas. “Before we posted it I hoped that maybe Kotaku, a games site would pick up on it. But the day after it went online, the Washington Post called me, and it just took off from there.” It has since been “liked” 177,000 times on Facebook, which as proven a very effective platform for promoting the game. Hoey and Smith are highly secretive about their future plans and declined to reveal what they plan to talk about in Frankfurt, although Hoey does admit “We’re pretty much done with the 8-bit literary platform,” and rumor has it they are at work on a game based on Jane Eyre. Nevertheless, the Gatsby/Nintendo fusion is likely to spawn several more interesting mash-ups. Charlie Hoey and Pete Smith will present “Game in a Book – The Great Gatsby: Case Study” at the Frankfurt Book Fair, Wednesday, October 12, as part of the StoryDrive conference. DISCUSS: Are Games a Gateway into Classic Lit for Reluctant Readers?